I had originally intended to use orzo for the pasta, but found some really inexpensive tortelloni at Aldi and scooped that up instead. 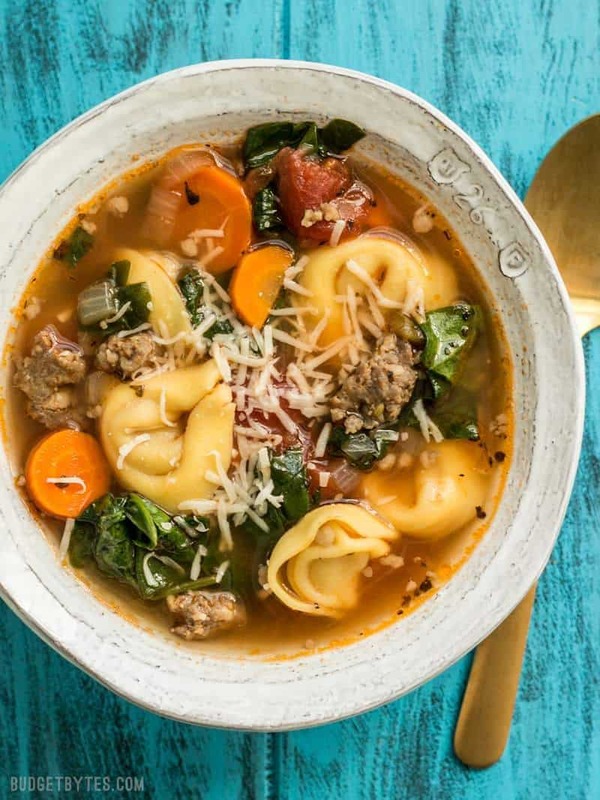 The cheese filled tortelloni made the soup quite filling and added a good amount of flavor and texture variety. If you can’t find affordable tortelloni, you can use just about any pasta shape. If using orzo like I had planned, I’d probably add about 1/2 cup. 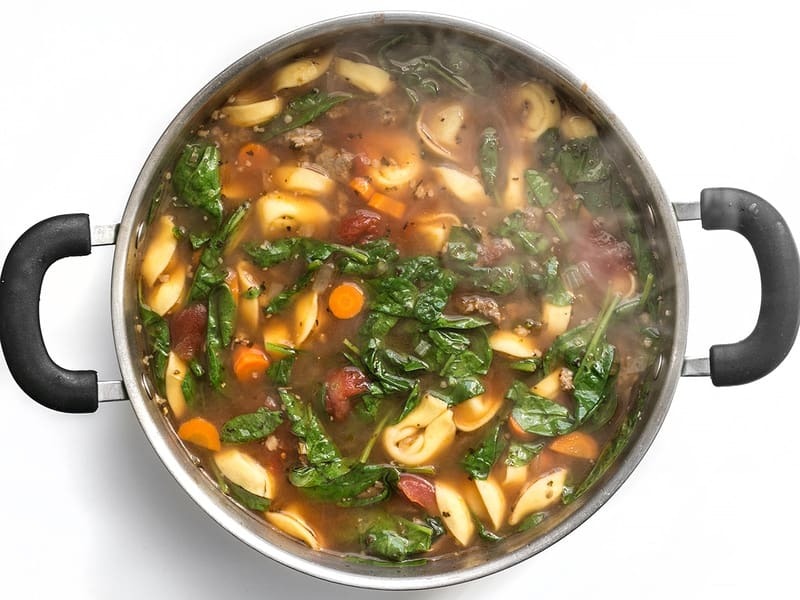 For larger pasta shapes, I’d probably use about 1/4 pound so that it doesn’t overtake the soup. 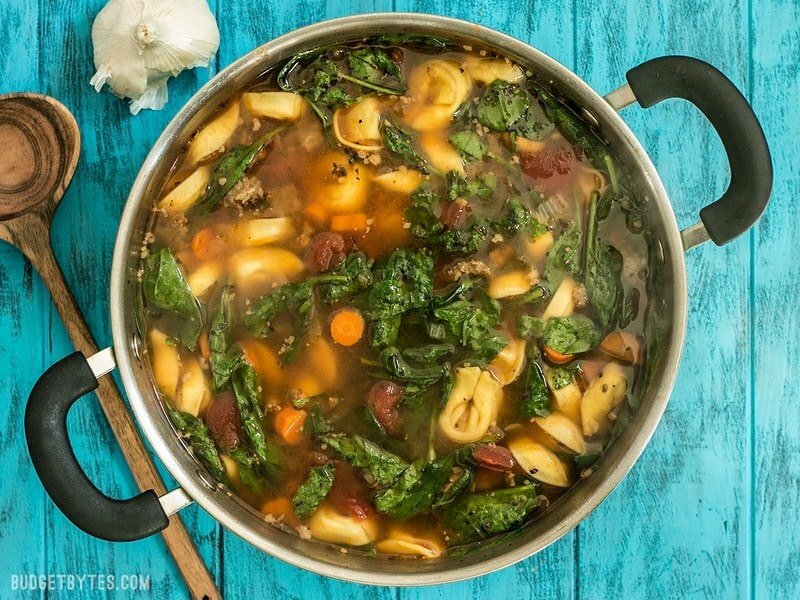 If you want to skip the sausage and make this soup vegetarian, I’d suggest grabbing some Italian seasoning blend and adding a healthy does of that to make up for the herbs and spices that are in the sausage, which go a long way toward flavoring the entire pot. You may also want to add an extra tablespoon or so of olive oil for richness. 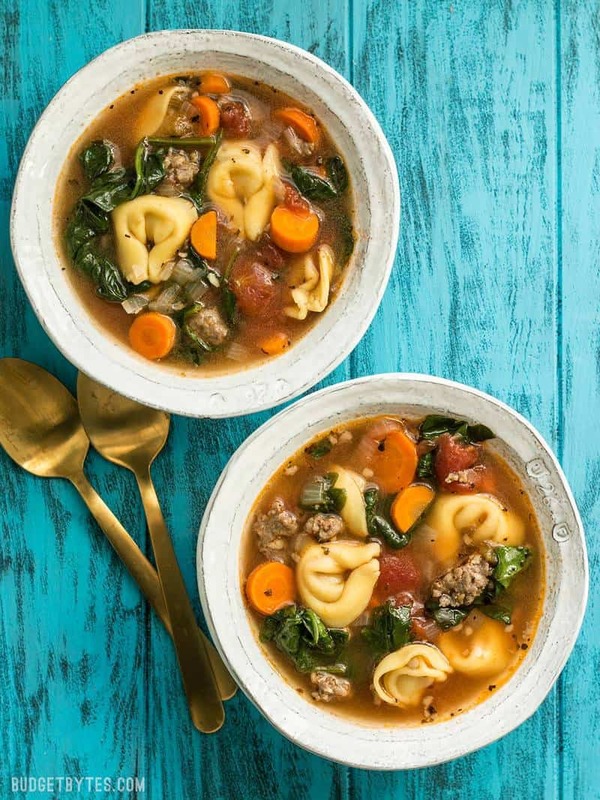 This light but filling vegetable packed Sausage and Tortelloni soup is the perfect lunch for fall. Pair with crusty bread for dipping! 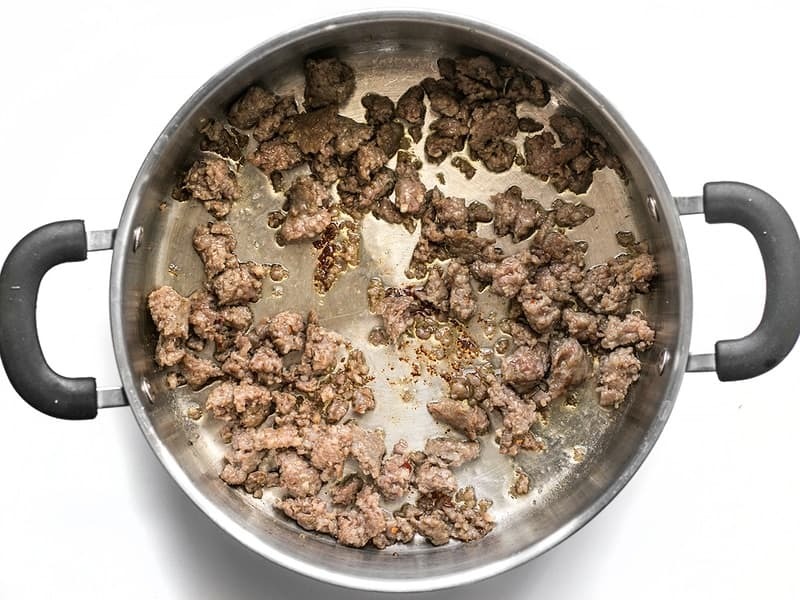 Add the olive oil and sausage to a large soup pot (if your sausage is in casings, squeeze it out of the casing). Sauté the sausage over medium heat, breaking it up into pieces as you stir, until it is browned and cooked through. While the sausage is cooking, dice the onion and mince the garlic. Add the onion and garlic to the pot and continue to sauté until the onions are soft and transparent. While the onions are sautéing, peel and slice the carrots. Add the carrots to the pot and sauté for just a few minutes more. Finally, add the stewed tomatoes (with all the juices from the can), basil, oregano, and some freshly cracked pepper. Use your spoon to break the tomatoes into smaller pieces. Add the vegetable broth and water to the pot. Place a lid on top, turn the heat up to high, and bring it up to a rolling boil. Once boiling, add the tortelloni, and continue to boil until the tortelloni is tender (about 8 minutes). Turn the heat off, add the spinach, and stir until the spinach has wilted. Taste the soup and add salt if needed (I did not add any, but it will depend on the salt content of the broth you use). *Stewed tomatoes have been cooked with herbs and add a unique sweetness to the soup. 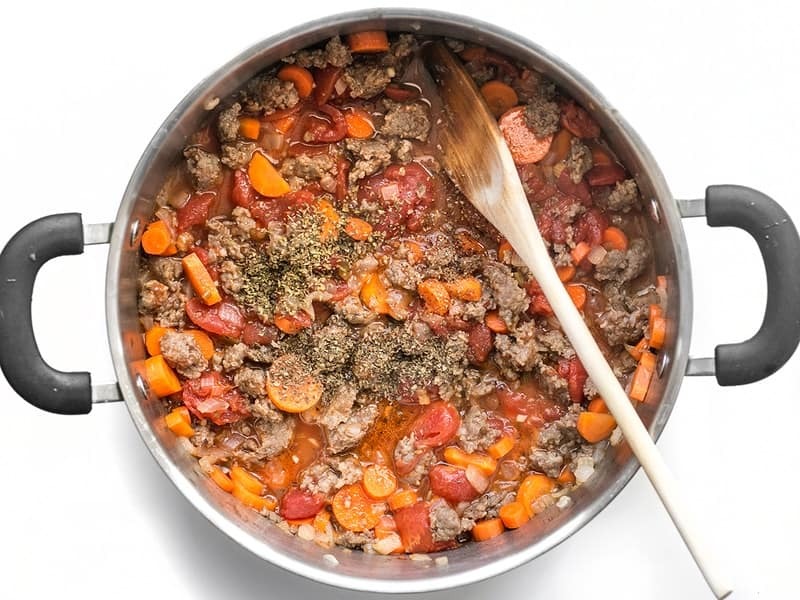 If needed you can use regular canned diced tomatoes, but it will change the flavor of the soup. I used about 1/2 lb. 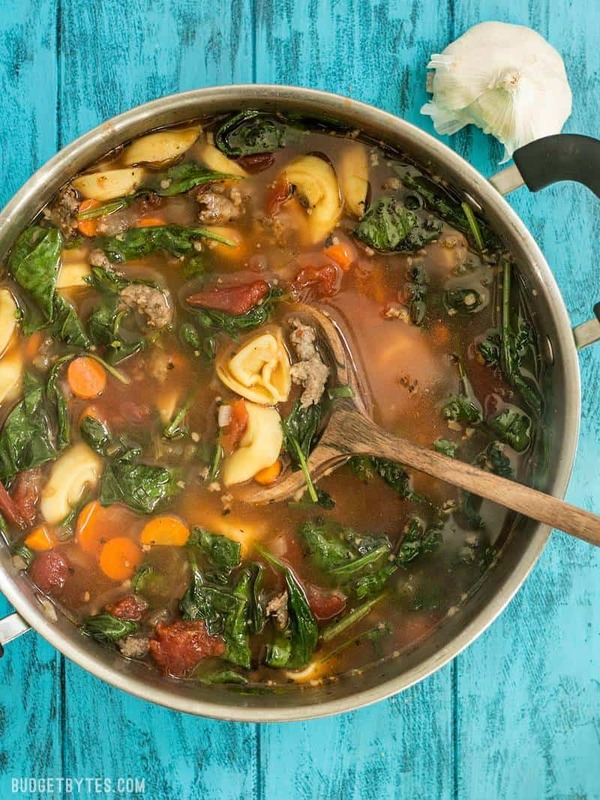 of Italian sausage for this soup and froze the rest. 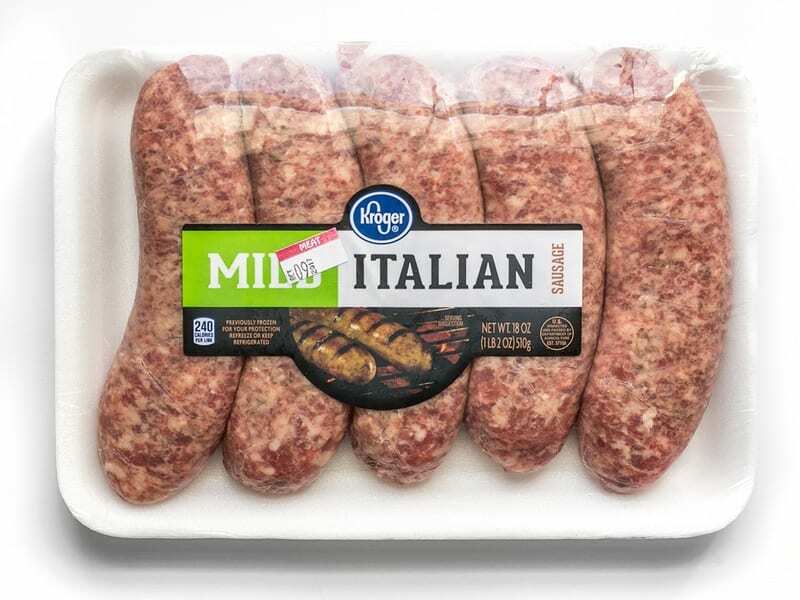 You can use mild, sweet, or hot Italian sausage. If you get sausage in the casing like I did, squeeze it out of the casing into the pot. 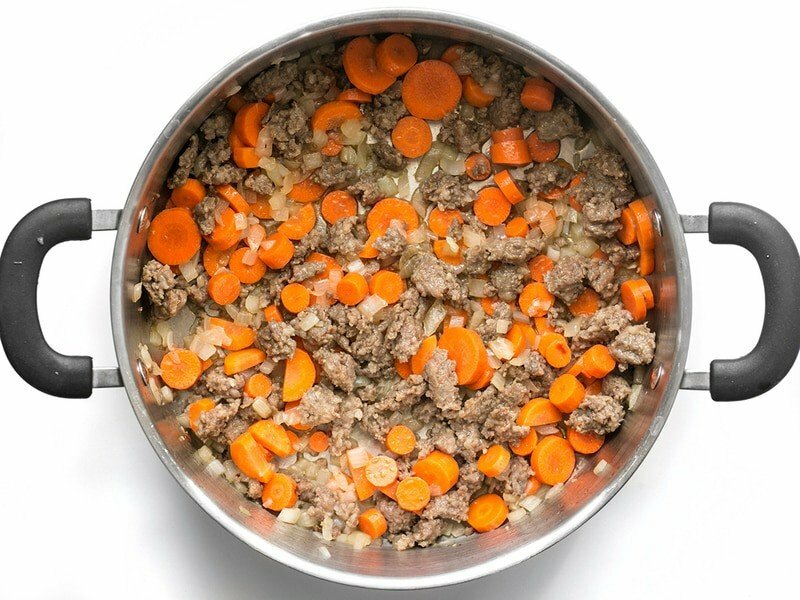 Add the sausage to a large soup pot along with 1 Tbsp olive oil and sauté over medium heat until the sausage is browned and cooked through. While the sausage is browning, dice an onion and mince two cloves of garlic. Add them to the soup pot and continue to sauté until the onion are soft and transparent. While the onion and garlic are sautéing, peel and slice about 1/2 lb. carrots (3-4 carrots). Add them to the soup pot and continue to sauté for a few minutes more. Add one 15oz. can of stewed tomatoes, with all their juices. 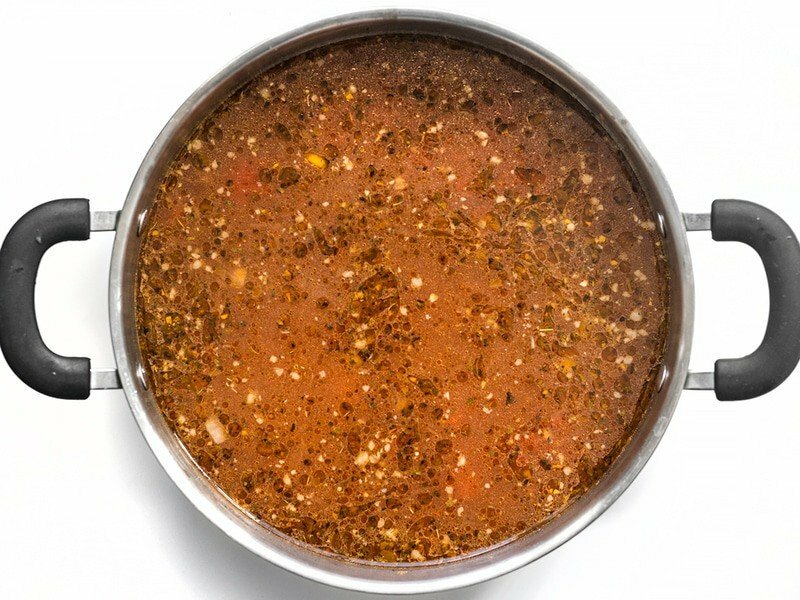 Stewed tomatoes are cooked with herbs and spices and have a decidedly sweet flavor, which makes this soup’s broth super delicious. The tomato pieces tend to be large, so you’ll want to break them up with your spoon. Add 1/2 tsp dried basil, 1/2 tsp dried oregano, and some freshly cracked pepper. You can see here how the tomatoes have been broken up into smaller pieces. The stewed tomatoes should be quite tender and you can just squash them with the spoon until they break up. Add 3 cups vegetable broth and 3 cups water to the pot. Place a lid on top, turn the heat up to high, and bring it up to a boil. This is the package of tortelloni I used. 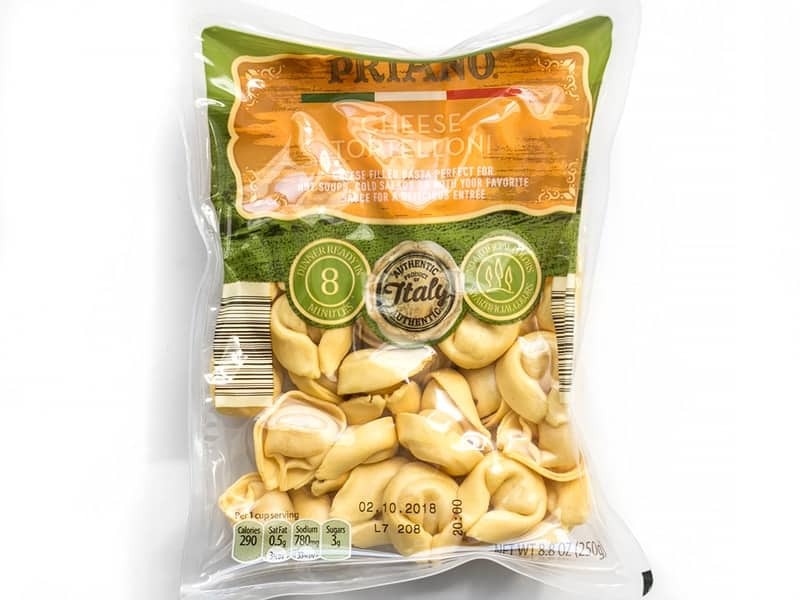 When looking for tortelloni at the store, you can usually find it a few places: dried tortelloni will be with past in the pasta aisle, fresh tortellini will be in the refrigerated section near cheeses, and often you can find frozen tortelloni near frozen bread and ravioli. 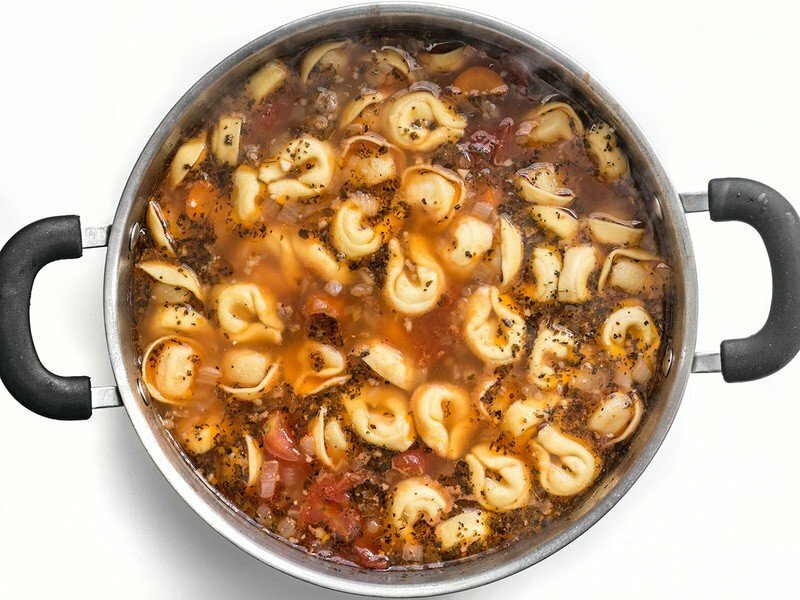 Drop the tortelloni into the boiling soup and boil until the tortelloni is tender. Note: Fresh tortelloni cooks very quickly compared to dried, so check the package for guidance. Finally, turn the heat off and add 1/4 lb. fresh baby spinach and stir it into the hot soup until wilted. Taste the soup and add salt if needed. I had an 8oz. bag of fresh spinach and just estimated half of the bag. And that’s it! 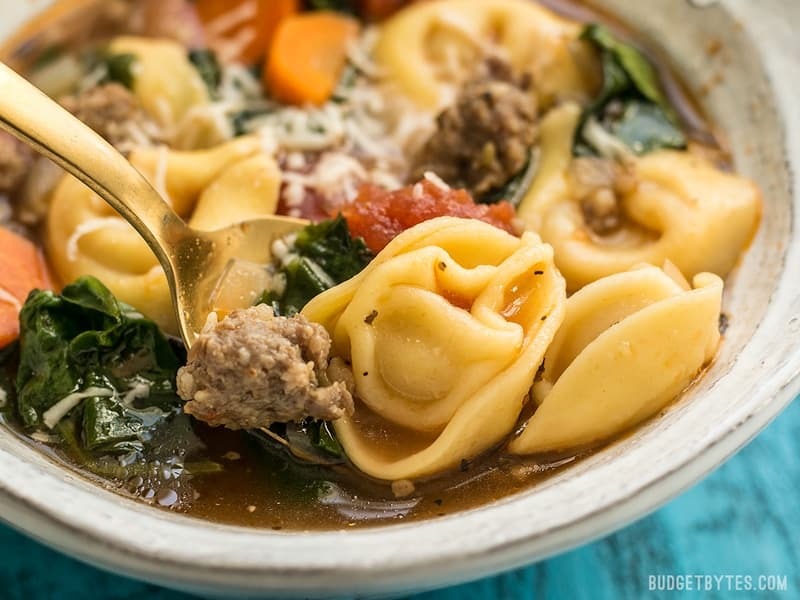 A huge pot of super delish Sausage and Tortelloni Soup for under $10! You can definitely freeze the leftovers of this, too. I made this for lunch yesterday and we loved it!!!!! What I especially liked was how quickly it all came together. I read the recipe wrong and used 6 c of veg broth – not a big change, but something I feel I should disclose. 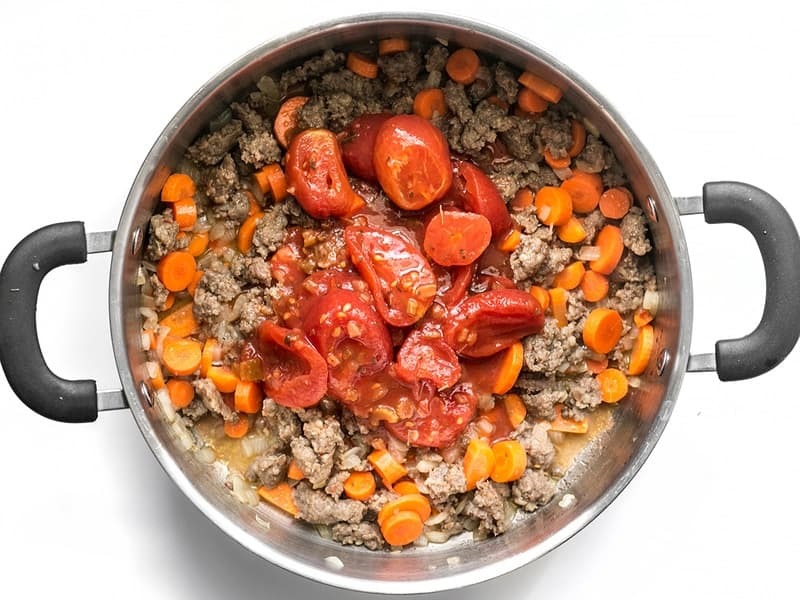 Also, I used Tofurkey Italian Sausage – I used half a package and sliced them up into very small chunks and added them w/the stewed tomatoes. Probably there’s nothing budget-y about using Tofurkey products ($!) but it gave this soup the flavor I think was intended. I was also generous with my basil and oregano. The soup was absolutely FABULOUS and I’ll definitely be adding this my rotation! Thank you so much!